When we think of movies with twisted and demented ideas, we may immediately consider more modern films, such as Hostel or Saw. But disturbing movies have been around for years, and there were many films from the 60s and 70s with some seriously sick notions. Take The Manitou for example. Any film which opens with a fetus growing on a woman's neck is barreling down a road of wacky notions. As noted above, The Maniou opens with Karen (Susan Strasberg) seeking advice from her physicians, Dr. Hughes (Jon Cedar) and Dr. McEvoy (Paul Mantee), for a lump on her neck. At first, the doctors feel that the lump is a tumor, but X-rays reveal a fetus-like shape inside of the lump, and the protrusion is growing at an alarming rate. The doctors decide to operate. Scared and lonely, Karen tracks down her old boyfriend, Harry Erskine (Tony Curtis), who makes a living as a spirit-medium, shaking down old ladies with Tarot card readings. Harry is surprised to see Karen, but immediately comforts her when he learns of her condition. When the operation is a failure, Harry begins to suspect that something supernatural is occurring with Karen. He seeks the help of an old friend, Amelia (Stella Stevens), whose séance gives Harry clues as to what is happening. After visiting Dr. Snow (Burgess Meredith), an expert on Native American cultures, Harry becomes convinced that Karen is the victim of black magic. John Singing Rock (Michael Ansara), a Native American medicine man, confirms Harry’s suspicions, and reports that a 400-year old medicine man is attempting to be reborn through Karen. Using Singing Rock’s native abilities and the hospital’s scientific equipment, Harry vows to save Karen’s life and defeat the evil inside of her. But, for everything this crazy movie does right...well, for everything that it does which grabs the audience's attention, it does something wrong. Once the medicine man emerges from Karen, there are several scenes where it just stands in a room. Now, I can see this working in a novel, as our heroes try to decide what to do next. But, I don't have to tell you that a movie where the villain does nothing isn't a very exciting movie. But, what do you expect from the director of such turkey classics as Grizzly and Day of the Animals. The late William Girdler doesn't show much visual flare in the film, and only a few scenes are truly effective -- the most notable being one where a character levitates. The film's finale is silly and seems compelled to emulate Star Wars, which had just come out the previous year. The special effects of the final battle are very cheesy and dated, and the entire concept of this scene is ludicrous. The cast does a good job of playing this bizarre material straight, save for Tony Curtis, who appears to be in another movie altogether. Curtis' 70s leisure-wear must be seen and his dialogue is priceless. We learn that the medicine man is named "Misquamacas", but Erskine keeps calling him "The Mixmaster" (I think I've seen that infomerical.) When Harry is told by Singing Rock that he can't call upon the great Indian god, Harry replies, "Oh, yeah, well he's going to get a person to person call from me....collect! " These scenes, and many others, make a good portion of The Manitou unintentionally laughable. With the success of films like The Exorcist and The Omen, the 1970s saw a rash of supernatural horror films. The Manitou was clearly made to cash in on that craze, and several others as well, as it contains an earthquake (a nod to the Irwin Allen disaster films) and a laser light show (a nod to Star Wars). Still, any film where a demented medicine man emerges from a woman's back can't be all bad, and it's clear that the "birth" scene has influenced many other films. Despite have an Oscar-nominated actor in the lead, The Manitou is an exploitation film through-and-through and fans of 70s horror should have a blast with this one. 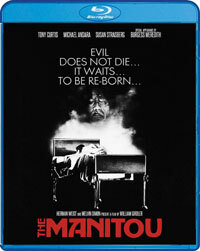 The Manitou could have a ballet-based sequel called “The Manitou 2” on Blu-ray Disc courtesy Shout! Factory. The film has been letterboxed at 2.35:1 and the Disc contains an AVC 1080p HD transfer which runs at an average of 37 Mbps. The image is sharp and clear, although it does show some mild grain at times and a few white specks on the picture. The colors look good and the image is never overly dark or bright. The depth looks good, as most movies from this period can have a flat look. The Disc carries a DTS-HD Master Audio stereo track which runs at 48 kHz and a constant 1.6 Mbps. The track doesn’t offer any truly dynamic effects, but the sound effects and music never drown out the dialogue. There are a few moments where there are obvious stereo effects with the music. The Manitou Blu-ray Disc contains a few extra features. We begin with an AUDIO COMMENTARY from film historian Troy Howarth. “Interview with Producer David Sheldon” (11 minutes) allows him to discuss his career, which began in theater, and leads to an overview of this films, with a specific emphasis on how he got involved with The Manitou. We get to meet the man behind the story in “Interview with Writer Graham Masterson” (28 minutes). The author dives into his life-story, giving an overview of what inspired him to be a writer, and then talks about writing The Manitou and provides his reaction to the film. He then talks about the other Manitou books as well as some of his other work. The extras are rounded out by a THEATRICAL TRAILER, three TELEVISION SPOTS, and an IMAGE GALLERY.